Can't Find The Recombinant Protein You Need? RayBiotech has provided Custom Protein Services since 2006. Our comprehensive service program covers every step of production from gene cloning through protein purification, and includes downstream processing such as protein desalting, lyophilization, vialing, and conjugation to tags, fluors, or other labels. If you can’t find your protein of interest on the market, please contact our technical support team to discuss your project and create a custom quote. Our expert team of scientists is here to help you achieve your research goals. ✔ Complete. Gene cloning/gene synthesis to protein purification. ✔ Fast Turnaround. 3 weeks for bacterial expression; 4-5 weeks for mammalian cell expression. ✔ Optimization. Our expert team of scientists can strategically alter expression vectors or host systems to obtain optimal gene expression. ✔ Protein Processing. Desalting, aliquoting, lyophilization, and conjugation services are available to your specifications. ✔ Competitive Prices. Ask about our introductory discount for first-time customers! ✔ Low-Risk. Close coordination by our technical support team with updates on each milestone phase of project. Customer is only billed for milestones successfully completed. RayBiotech offers 4 different gene expression systems to serve a variety of research requirements. See chart below for a comparison of features and specifications. Glycosylation None Not indentical to mammalian systems. High Mannose. Not identical to mammalian systems. TruExp™ is a state-of-the-art mammalian cell-based expression system developed by RayBiotech which efficiently delivers recombinant proteins with native conformations and post-translational modifications (PTMs). A result of years of effort by the R&D team, TruExp is an ideal system for the production of mammalian proteins which must retain some or all of their native functions, and an excellent option for high molecular weight or difficult to express proteins. ✔ High Expression. Typical yield ranges from 2 - 355 mg purified protein per liter of culture (Figure 1, Table 1). ✔ Secretion. Expressed protein is secreted into the culture medium, facilitating high purity levels (in contrast to recovering protein from highly contaminated lysate fractions) (Figures 1 & 2). ✔ Multiple Tags. Choose from a variety of removable fusion tags (i.e., His, myc, Fc, GFP, etc.). ✔ Scalable. Suspension cell cultures easily scale up to 10 liters or more. ✔ No Biohazard. Serum-free medium and animal source-free materials eliminate biohazard risk. Figure 1. Raybiotech TruExp Mammalian Cell Gene Expression System demonstrates gene over-expression and secretion. Six human genes (H1-6) and 3 mouse genes (M1-3) were expressed by the TruExp expression system. 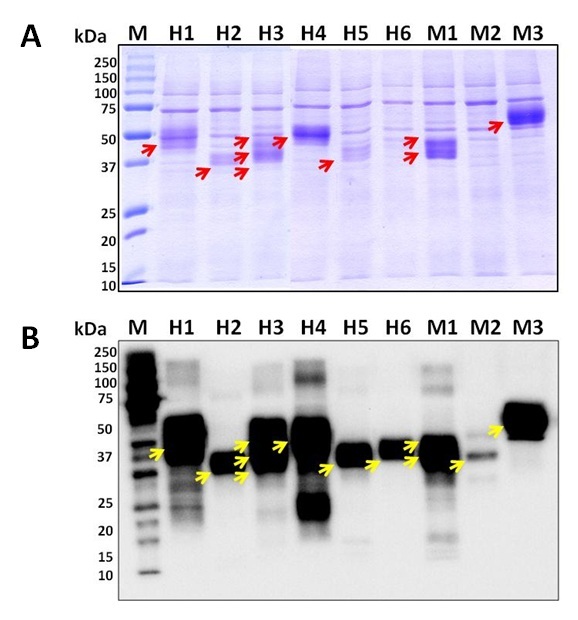 Cell culture supernatants (10 µL) were applied to 12% SDS-PAGE (A) and Western blot probed with anti-his tag monoclonal antibody (B). Except for genes H6 and M2, all overexpressed genes display additional secreted protein bands (A, red arrows). All genes were expressed, with some displaying abundant post-translational modifications, evident by increased molecular weights compared to the predicted sizes (B, yellow arrows). M = protein standard markers (kDa). Figure 2. Representative purified human proteins from Raybiotech TruExp Mammalian Cell Gene Expression System.Affinity-purified recombinant proteins from culture supernatants of transfected mammalian cells exhibit high purity and intact protein bands, even at MW larger than 100 kDa. M = protein standard markers (kDa). 1 week Protein affinity chromatography purification Comprehensive report including induction conditions, method of extraction, SDS-PAGE data, protein concentration, etc. Provide gene template or subclone your genes into either an expression vector provided by you or an overexpression vector from Raybiotech, Inc.
SDS-PAGE and Western blotting analysis to confirm the gene expression, expression levles, protein secretion, protein solubility, etc. 1.5 weeks Cell lysis, protein extraction, centrifugation, etc. Comprehensive report including induction conditions, method of extraction, SDS-PAGE data, protein concentration, etc. QC process, deliver protein product and project report, etc. To complement our Gene-to-Protein service packages, RayBiotech offers an array of molecular biology technical services for your convenience. These services can be purchased individually or included in your custom service contract. Our technical specialists are available to consult with you and plan a work flow that addresses your specific research goals. ✔ Protein affinity purification, desalting, lyophilization, etc. ✔ Cell culturing, cell transfection, cell lysate preparation, etc. To obtain a quotation, please fill out a Custom Protein Request Form or feel free to contact us directly.